In 1993, 8000 representatives of the religions of the world gathered in Chicago, on the centennial of the historical 1893 World's Parliament of Religions. The objectives were to "promote understanding and cooperation among religious communities and institutions" and "encourage the spirit of harmony and celebrate, with openness and mutual respect, the rich diversity of religions.'" The Parliament also raised a pressing question: How do local Christians respond when they discoverthat the religions of the world now reside in their town? Most of the non-Christian representatives to the first Parliament came from outside the U.S. In 1993, however, when the organizers invited the religious communities of Chicago to form host committees for the event, more than half turned out to benon-Christian: Baha'i, Buddhist, Hindu, Jain, Jewish, Muslim, Sikh and Zoroastrian. In this book, Paul Numrich presents eleven case studies of local Chicago-area Christian responses to America's changing religious landscape. Offering a broad, balanced, and sympathetic sampling, he wants to enable readers to make informed decisions about their own attitudes and strategies regarding their non-Christian neighbors. Included are Protestant, Catholic, and Orthodox Christian cases, cases fromimmigrant and African-American communities, and perspectives ranging from conservative to liberal, from evangelical to pluralist. His study will be of great interest to scholars of American religious pluralism but is also designed to be usable by adult congregational study groups and church leaders at allpoints on the theological spectrum and from every denominational background. - Publisher The religious landscape of the United States has changed dramatically in recent decades. How are Christians relating to their Buddhist, Hindu, Muslim, and other new religious neighbors? Using local examples,The Faith Next Doorcovers the gamut of Christian responses to America's multireligious reality. We read about the debate over a new Hindu temple in town, the Episcopal church that has hosted a mosque since 1987, the cooperative efforts between African American pastors and Muslim leaders, immigrant Christians seeking to save their non-Christian fellow immigrants, evangelicals resettling immigrants and refugees through "friendship evangelism," Catholics learning about other religions in the spirit of Vatican II, Greek Orthodox Christians and Turkish Muslims gaining a new appreciation of their shared history, and more. The book also examines how the events of September 11, 2001 have shaped Christian approaches to believers from other faiths, from engaging in dialogue to hoping for conversion. Here Christian theology meets the multireligious real world, with multiple results suggestive of national trends.The Faith Next Doorwill appeal to Christians from all denominations and perspectives who seek models for relationships in the diverse contemporary context. It will also inform non-Christian readers and general observers of trends in American religion about the variety of local Christian responses to other religions. 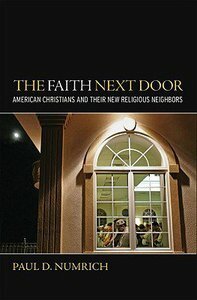 About "The Faith Next Door"
The religious landscape of the United States has changed dramatically in recent decades. How are Christians relating to their Buddhist, Hindu, Muslim, and other new religious neighbors? Using local examples,The Faith Next Doorcovers the gamut of Christian responses to America's multireligious reality. We read about the debate over a new Hindu temple in town, the Episcopal church that has hosted a mosque since 1987, the cooperative efforts between African American pastors and Muslim leaders, immigrant Christians seeking to save their non-Christian fellow immigrants, evangelicals resettling immigrants and refugees through "friendship evangelism," Catholics learning about other religions in the spirit of Vatican II, Greek Orthodox Christians and Turkish Muslims gaining a new appreciation of their shared history, and more. The book also examines how the events of September 11, 2001 have shaped Christian approaches to believers from other faiths, from engaging in dialogue to hoping for conversion. Here Christian theology meets the multireligious real world, with multiple results suggestive of national trends.The Faith Next Doorwill appeal to Christians from all denominations and perspectives who seek models for relationships in the diverse contemporary context. It will also inform non-Christian readers and general observers of trends in American religion about the variety of local Christian responses to other religions.